Diwali, or Dipawali, is Hinduism's biggest and most important holiday of the year. It takes place in mid-October. Over the centuries, Diwali has become a national festival enjoyed by most Indians regardless of faith. Along with Hindus, Jains, Buddhists, and Sikhs may all celebrate Diwali. Northern India: Diwali is the celebration of of King Rama's return to Ayodhya after defeating Ravana by lighting a row of clay lamps. Southern India: Diwali is celebrated as the day Lord Krishna defeated the demon Narakasura. Western India: Diwali marks the day Lord Vishnu sent the demon King Bali to rule the underworld. In Jainism, Diwali marks the day Lord Mahavira reached nirvana in 527 B.C. In Sikhism, it marks the day the Sixth Sikh Guru was freed from imprisonment. No matter why it is celebrated, there is one common reason for celebrating the holiday: it marks the victory of good over evil. 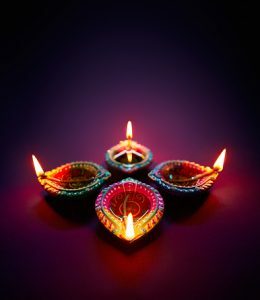 There are five days of Diwali, and each has a special meaning. Celebrated in Northern and Western India, houses and businesses are cleaned, renovated, and/or decorated. Often, women and children decorate with Rangoli or colorful floor designs both inside and outside on the walkways of their homes. It is also a major shopping day, particularly for gold or silver. This day marks the birthday of Lakshmi, the Goddess of Wealth and Prosperity, and the birthday of Dhanvantari, the God of Health and Healing. Also called the Choti Diwali, the second morning is filled with religious rituals and festivities. Sometimes, there are special bathing rituals using fragrant bath oils. Women decorate their hands in classic henna designs, while families prepare homemade sweets. The third day is the main festival day. People open their doors and windows to welcome Lakshmi, who is believed to roam the earth on this particular day of Diwali. Small earthenware lamps are filled with oil and placed around sidewalks, temples, and more. Important friendships and family are recognized throughout the day by visits and exchanging gifts. At night, patakhe, or fireworks are set off. The fireworks are believed to help chase away evil spirits. Similar to worldly anniversary celebrations, this day celebrates the devotion of husbands and wives. Husbands give thoughtful gifts and, in many regions, newly married daughters with their spouses are invited into their parents' households for special meals. Diwali also marks the beginning of a new year. Merchants and shopkeepers close out the previous year and begin a new one with blessings from Lakshmi and other deities. Meaning "brother's second," the last day in Diwali celebrates sisters and brothers. Emphasizing the bond between siblings, day five is filled with prayers, food-sharing, gift-giving, and conversation.